Freshman Dessi Dupuy has broken the school record for most goals in one season, and has been a huge factor in making the women’s soccer team the No. 1 seed in the Old Dominion Athletic Conference (ODAC). “She is leading our team and the conference in goals and is in the top five in the nation – an extraordinary feat, especially for a freshman forward,” said Dr. Todd Olsen, head coach for Lynchburg. The Lynchburg native, who just a year ago was playing a few blocks away from LC at E.C. Glass High School, has already left an indelible mark on the team this season. “I cannot explain how it feels. It is crazy to me, but it feels great because I never expected this to happen,” Dessi said as she reflected on being ranked in the top three of several scoring categories nationally in NCAA Division III. 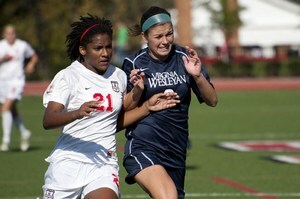 On the afternoon of October 26 in a game against Christopher Newport University, Dessi broke the previous school record of 25 goals in one season, set in 1997. • Tallied six assists this season, totaling 58 points. • Registered four game-winning goals in 19 games played. • Is third on the list for most points in a season, with at least two more games to play. Coming out of high school, she was a two-time District Player of the Year and was named the All-Region Player of the Year while making the All-State Team twice. Making the choice to come to University of Lynchburg was an easy one for Dessi. Dessi scored in her first collegiate game in a 3-0 win at home against Sewanee: The University of the South. After three contests without a goal, she broke out with nine-straight games with a tally. That stretch included a five-score performance against conference opponent Eastern Mennonite University which tied a school record for most goals in a game. The freshman had officially arrived on the collegiate soccer scene. Following that performance she scored a hat-trick in the next two games, giving her 11 goals in three matches. Dessi is a key component in helping Lynchburg complete another remarkable season. The team is 16-2-1 on the season which includes a 10-0-1 record in the ODAC. LC is currently ranked 13th in the nation and is on the heels of four-straight trips to the NCAA tournament which included an appearance in the Final Four in 2009. As head mentor of Lynchburg soccer, Dr. Olsen has helped the program grow into a national powerhouse in his 17 years leading the team. Local support has been apparent as Dessi has helped the team charge through the season, and remain a conference juggernaut. As the regular season closes, the team is poised to make a run at a second-straight ODAC title plus another trip to the NCAA tournament in November. While this season has been one for the record books, Dessi’s main goal is to help the team succeed.